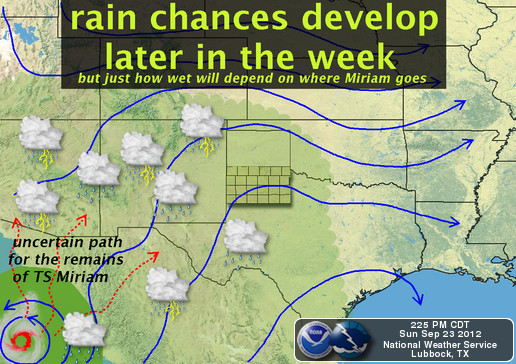 Severe T-Storms Along The Dryline Wednesday - Moisture From Miriam Late This Week. 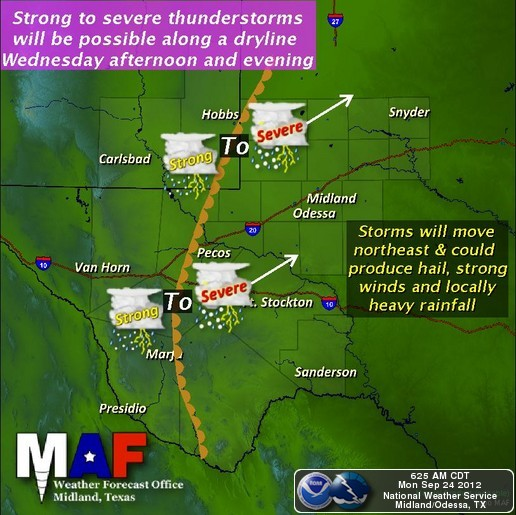 Severe T-Storms Along The Dryline Wednesday. 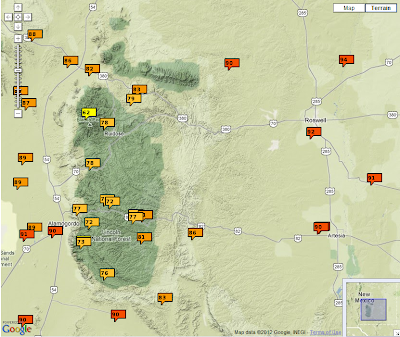 Sunday's high temps was a couple degrees cooler than Saturday's. 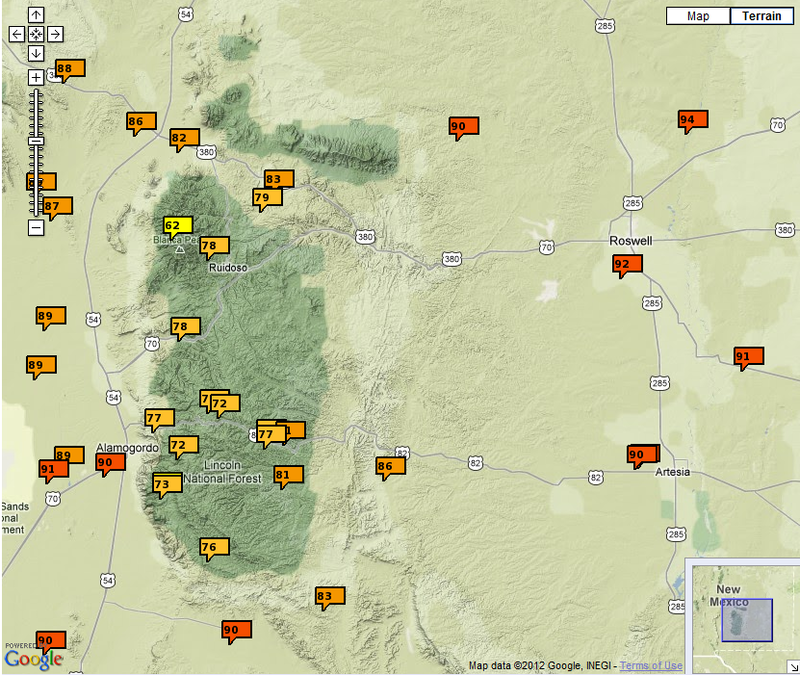 Most of southeastern New Mexico saw highs in the upper 80's to the low 90's. Similar readings are expected again today into Wednesday. Changes are coming starting as early as Tuesday afternoon. The dryline is forecast to develop over the southeastern plains, and a few widely scattered thunderstorms will be possible Tuesday afternoon and evening. 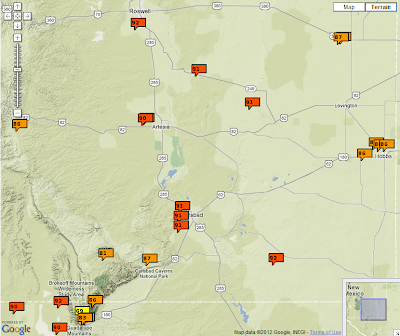 Most of these should occur over and near the mountains. Wednesday will see an increase in thunderstorm activity as the dryline sharpens up as an upper-level trough of low pressure swings across the area. Forecast surface cape values of 1200 j/kg, along with mid level lapse rates of 7.5 to 8 c/km will cause a few of our thunderstorms to become severe along and east of the dryline. Early this morning the models are hinting that the best areas for severe thunderstorms will generally be from Lea County eastward into west Texas. 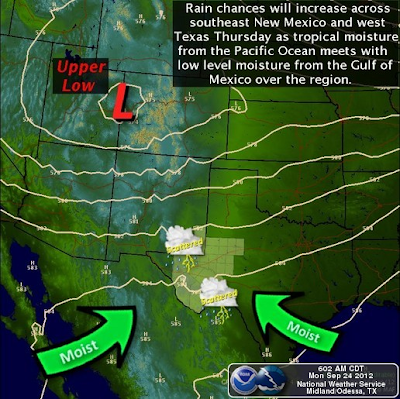 This may change if the dryline is able to back further into southeastern New Mexico. At this time it appears that large hail, damaging thunderstorm wind gusts in excess of 60 mph, deadly cloud to ground lighting, and locally heavy rainfall will be the primary severe weather threats. 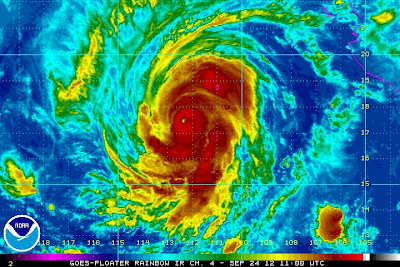 Hurricane Miriam Undergoing Rapid Intensification. IR Satellite Image Of Hurricane Miriam At 5 AM MDT. 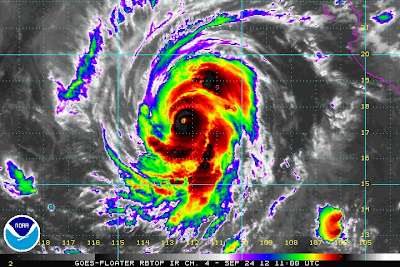 IR Rainbow Satellite Image Of Hurricane Miriam At 5 AM MDT. 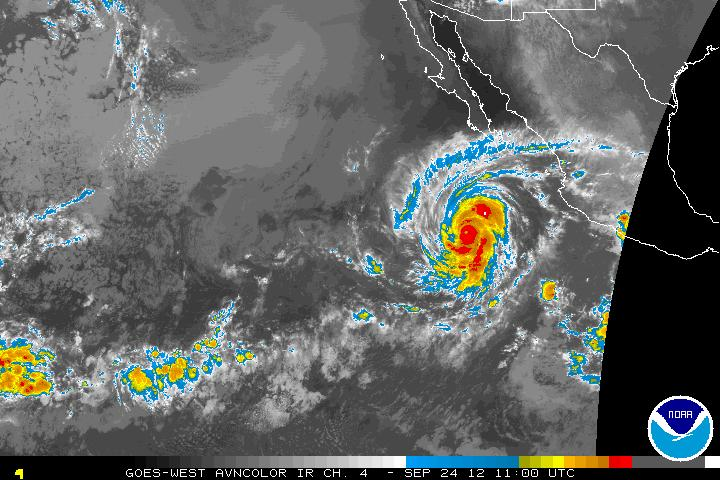 IR RBTOP Satellite Image Of Hurricane Miriam At 5 AM MDT. 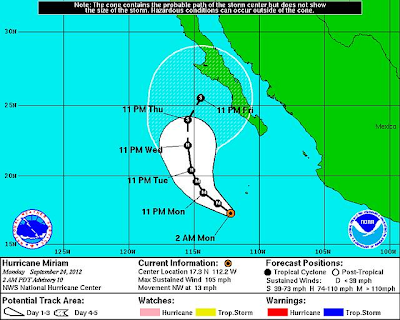 Hurricane Miriam NHC Forecast Track. 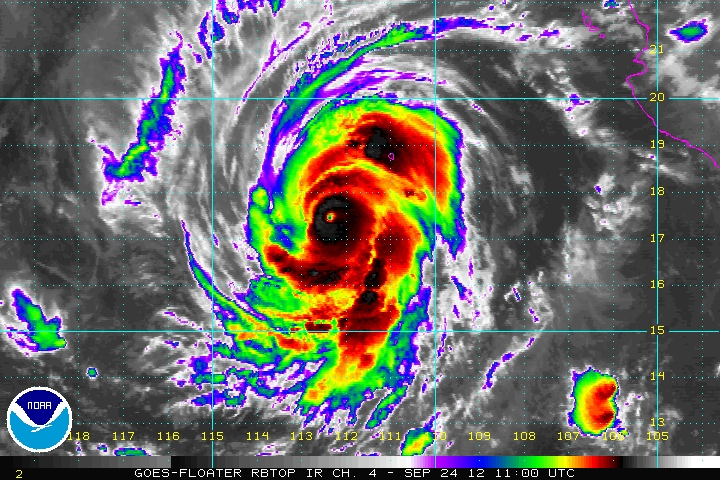 Hurricane Miriam is undergoing rapid intensification early this morning. The Category 2 Hurricane was located about 415 miles south of the very southern tip of the Baja Peninsula as of 3 AM MDT this morning. 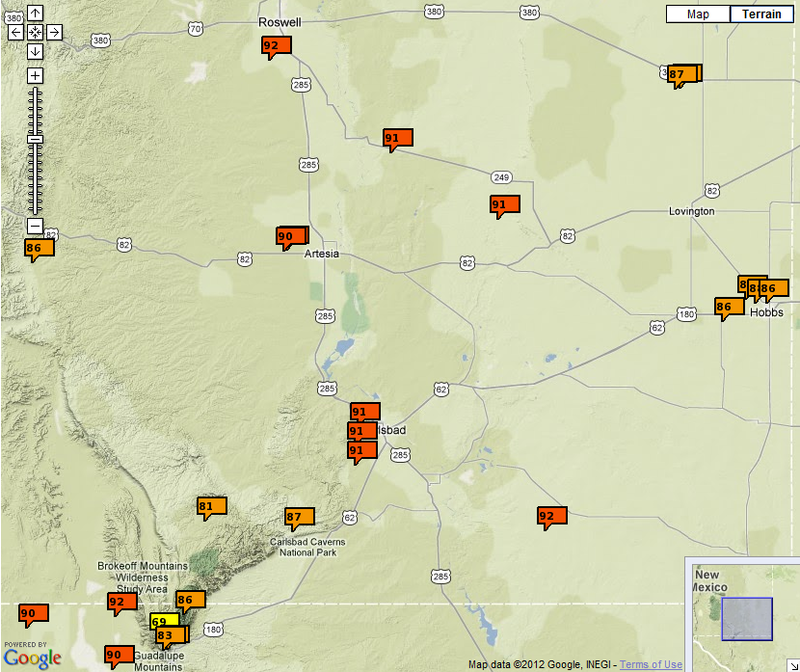 Miriam had sustained winds of 105 mph with gusts near 125 mph. Her central pressure has fallen to 971 millibars, or 28.67 inches of mercury. Miriam has a 10 nautical mile diameter eye that is embedded in the central dense overcast (CDO). Additional strengthening is likely today. Hurricane Miriam is forecast to continue to head off to the northwest today and tomorrow, and then make a turn to the north on Wednesday and Thursday. By Friday, Miriam should turn more to the northeast as the Hurricane is picked up by the mid-upper level trough of low pressure over the Desert Southwest and Great Basin. Remnant moisture from Miriam will begin to spread northeastward into southern, southeastern New Mexico, and west Texas by Thursday, and will likely increase on Friday into the weekend. There remains the potential for the area to pick up some badly needed widespread rainfall, some of which may be rather heavy, from Miriam, late this week into the weekend and perhaps into early next week. Just exactly where the heaviest rains will fall and when is still somewhat of an unknown this morning. The computer models are doing a better job of agreeing that the remnants of Miriam's moisture will head our way, but they still haven't worked out the details of this event yet.